‘Tis the season to be gifting! Thanksgiving is next week, which means that it’s time to make that gift-giving list (if you choose to do so). There are so many useful, cute, & affordable gift options out right now to fill your most fashionable friends with style & joy this season. Personally, I don’t buy gifts just for the sake of buying meaningless stuff to give to anyone. I like to pick special pieces that will really please a recipient & serve a function—even if that function is indulgence & luxury. When compiling your shopping list, consider if an item is something that they’ll actually use, that it’s not just a filler gift. Also, jot down their interests by their name on your list so that if you can look out for something particularly perfect for a friend or loved one. Lastly, I’ll often discuss with people close to me if they want to exchange gifts (& if so, establish a spending limit) or if they’d prefer to go out for dinner instead. Sometimes arranging a night with a group of friends with dinner & drinks is the best way to go. However, listing, shopping, wrapping, & giving are my favorite ways to put me in the holiday spirit. All of the below ideas are not just stylish, but they’re all under $15. I love discovering accessories as gifts because they add just a little bit more sparkle, which I know I’m always seeking for myself. What kinds of gifts are you shopping for this season? Where do you shop for the best deals this holiday? Happy Styling! The Stylish Five: Summer Must-Haves ($35 & Under)! Summer is in full swing & fall fashions are already hitting stores (ugh! ), but that doesn’t mean it’s too late (it really isn’t!) to enjoy some fun & affordable summer styles. It’s still only the first week of July, which means that there’s the rest of this month, all of August, & the first half of September awaiting for you to explore the many outfit & accessory possibilities for a variety of outdoor, everyday, & special occasions. If you need a style boost, here’s a little inspiration of the five summer must-haves that’ll make your summer wardrobe not only chic, but memorable & playful. 1. 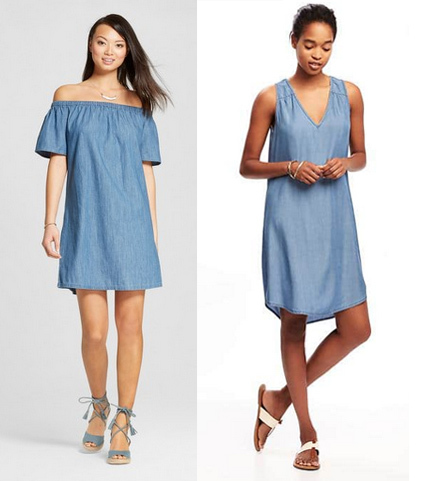 The denim dress is a hallmark of summer. It’s lightweight with the ultimate classic feel, both features that make this dress perfect for pairing with wedges or sandals, textures like basket weave or cork, as well as acting as a neutral foundation to pops of color in your accessories. SHOP: cold shoulder dress @Target & shift dress @Old Navy (both styles available in sizes XS – XXL). 2. I tend to rely on big earrings over the summer since heavier metals on my skin in the form of statement necklaces get uncomfortable when I’m out & about during a hot day when I’m trying to stay cool. 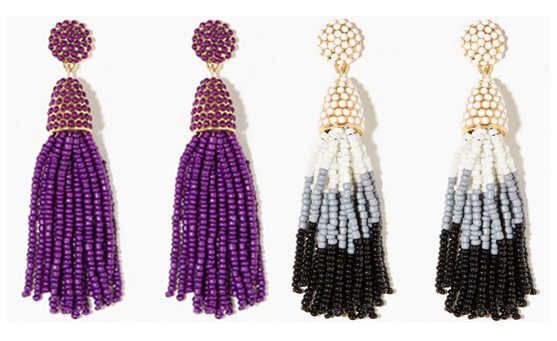 Try a bold tassel earring instead to play up your personality & bring out the colors of a printed dress. Not to mention, a tassel style helps frame your face with a little flair too! SHOP: purple shimmy earrings & multi color shimmy earrings @Charming Charlie. 3. There are so many shoe varieties when it comes to summer footwear, but the fringe trend is here to stay. A fringe sandal will not only relieve your feet the discomfort & stress caused by high heels in the heat, but also, it adds an extra splash of style to coordinate with neutrals like a button-down shirt & denim skirt. SHOP: multi color fringe sandal @Francesca’s & Fergalicious black fringe Tanya sandal @DSW. 4. A floppy hat is always a summer necessity to not only protect your face from the harsh rays of the sun, but also adding a little bit of humor to your beach-ready look. Whether you’re laying out for a nap or walking the boardwalk, floppy hats with a message will easily refresh a tropical cover-up or maxi dress on those beautiful weekends by the water. SHOP: Do Not Disturb hat @dressbarn & Sonoma Beach Please hat @Kohl’s. 5. Speaking of messages, a phrase / message clutch makes a statement that you’re all about style, taking it just seriously enough. If you’re headed for a weekend away or full-on vacation, clutches that celebrate the luxuries of style while abroad or having fun in the sun are sure to be the extra details that elevate your jersey dress or shorts romper, while also functioning to hold your most precious necessities. SHOP: I Need A Vacay clutch @Forever 21 & Au Revoir clutch @Lulu’s. Accessories Access: Holiday Party Circuit Clutches! ‘Tis the season to be glitzy! When you’re getting for your the biggest holiday events, shopping for & coordinating your favorite party dresses & shoes, don’t forget about the all-important clutch, especially when hitting the cocktail party circuit where a bulky bag just won’t do. Investing in a classic, all-purpose clutch bag will serve your wardrobe over & over again, & this time of year, you won’t even have to break the bank for that final finishing piece. Take some inspiration from red carpet pros whose clutch game is on point for any occasion, including Reese Witherspoon, Anne Hathaway, Gigi Hadid, Emma Roberts, Jennifer Hudson, Anna Kendrick, & Kerry Washington. Because it is the holiday season, I scouted the web for party-specific bags that will pop with any look, whether it’s an LBD, sparkly frock, sleek jumpsuit, or fit & flare number. The following selections are $40 & under from some of my favorite retailers that I often turn to when getting my wardrobe state of mind into party mode. SHOP: Tevolio merlot mesh clutch @Target, Luxe by Carmen Marc Valvo tassel clutch @dressbarn, sequin shoulder bag @H&M, & faux fur pouch @Nordstrom. SHOP: metallic rhinestone clutch @Francesca’s, burgundy velvet minaudiere @Century 21, wine foldover clutch @Forever 21, & gold ring clutch box @Icing.